It’s an old-fashioned stereotype that men aren’t interested in fashion. There are plenty of guys out there who love getting creative with their wardrobe and experimenting with styles to keep things fresh. If you’re the type of guy who loves all things fashion, or if you just want to elevate your wardrobe a little and get out of a style rut, use these off beat fashion tips to take things to the next level. 1. Mix up your suit style. 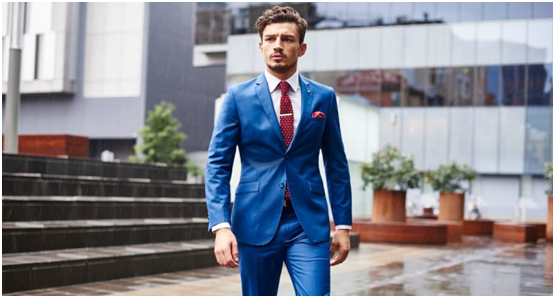 A classic suit always looks awesome, but guys with a little more fashion edge may want to play with the traditional look to create a more interesting feel from their suit. One easy way to do this is to play with the accessories. Switch out your classic tie for bow ties, they have a retro look that you just can’t get from a standard tie. Tryadding in a patterned silk scarf or colourful pocket square to bring some extra energy to your formal look. 2. Get your nerd on with glasses. If you legitimately need glasses, there’s no excuse not to have fun with your eyewear. Experiment with chunkier frames or a totally different shape than the style you’re used to. It’ll completely transform your look and could take your usual casual wardrobe from drab to geek chic. Even guys with 20/20 vision can rock this trend – just opt for non-prescription lenses and don’t mention to your friends that they’re purely cosmetic. 3. Bring bright colour into your wardrobe. Too many men get stuck in a rut when it comes to the colour palette of their clothes. There’s no reason to stick with neutrals, black, and navy, especially if you want to attract a bit more attention with your fashion choices. Bring some brightness into your day by wearing bold colourful pants – it’s easy to do if you often wear chinos or slim jeans. If you’re a little shy about taking the plunge, incorporate colour with bold t-shirts, sunglasses frames, or bright trainers. 4. Embrace the man bag. There’s no reason to be nervous about man bags. They’re a staple of every fashion-forward man’s wardrobe, and they’re also incredibly handy. Keep your wallet, keys, textbooks, or whatever you need to lug around with you for the day in a smooth leather satchel for a classic look, or try out cool and colourful backpacks if you prefer street style trends. 5. Raise your hem. Rising hemlines aren’t just for the ladies. Standard length trousers are boring and stuffy for summer, so give your outfit a lift by wearing cropped trousers instead. Cropped colourful chinos can be paired with sockless boat shoes or loafers for instant summer style that has a light-hearted, preppy vibe. 6. Mess with your hair. Don’t be that guy who has the same hairstyle for decades on end. Play with your hair and see what happens. Buy a simple product like a good quality hair wax and play around with your hair freely in the mirror. It may look ridiculous, or you could create a killer new fashion style that you love. 7. Overdress with confidence. Never be afraid to be better dressed than the other men you’re hanging out with. As long as you’re wearing your clothes with confidence, you’ll stand out in a good way.